Very cute Vintage style smock / nightdress with sewn elasticated short arms to give delicate ruffle, large neck opening with edge binding so that the garment can be put over the head (no zip) and finally gentle lace elastic above the hemline to give a gentle ruffle to the lower section of the dress. A great garment for ABDL, sissy wear or playful bed wear. Unisex Adult Baby fully fitted smock / dress, with short puffy sleeves, frilly bottom and a rear zip. Cut just above the backside to show frilly pants to full effect. 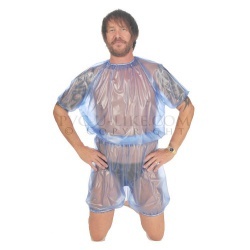 ​One size Unisex plastic playsuit with elasticated neck entry with frills, elasticated waist, legs, short arms with frills and frills across the bum. An essential AB outfit. All in one Ladies fit PVC Adult Baby Grow with front popper opening, elasticated wrists, attached feet, and poppers all the way down the legs to allow nappy changing. An essential in any Adult Baby / Diaper Lover's collection! Based on PVC-U-Like's romper suit, this boys playsuit has attached bloomers, rear zip entry, tighter neck, short elasticated sleeves, elasticated waist and legs. Perfect for plastic and ABDL play alike!